In order to investigate the effects of cross-sectional shapes on the sound characteristics of polyester fibers, 10 specimens were woven into a twill structure made of round, hollow, triangular, u-shape, cruciform, and composite cross-sectional (▴/▴, ()/▴,Y y) fibers. Their rustling sounds were recorded, and their sound spectra were obtained from FFT analysis. Physical sound parameters (LPT, ΔL, Δf) and Zwicker’s psychoacoustic parameters of the loudness(Z), sharpness(Z), roughness(Z), and fluctuation strength(Z) were calculated from the sound spectra. 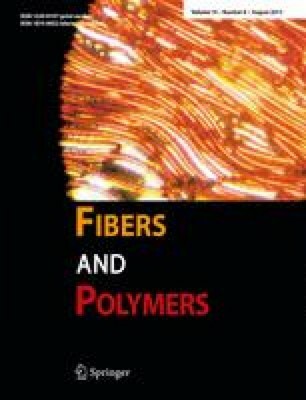 According to noncircular cross-section fibers, the hollow shaped fiber had the highest value of LPT, ΔL, loudness(Z), and fluctuation strength(Z). The triangular shaped fiber had a lower value of LPT, ΔL, loudness(Z), and roughness(Z) than those of the round shaped fiber. Among composite cross-section fibers, C1 (▴/▴) and C3 (Y y) had higher values of LPT, ΔL, Δf, and loudness(Z) but C2 (()/▴) had lower values. Also the LPT, ΔL, sharpness(Z), and roughness(Z) values of different denier were similar to each other, but the Δf and loudness(Z) values increased as the denier increased.